Stephen Miller of the Washington Education Association says school districts where teachers have walked out are committing "wage theft." As teachers in a record number of Washington school districts strike this week, a top official with their union says the unwillingness of superintendents and school boards to negotiate higher pay raises for teachers is a crime. 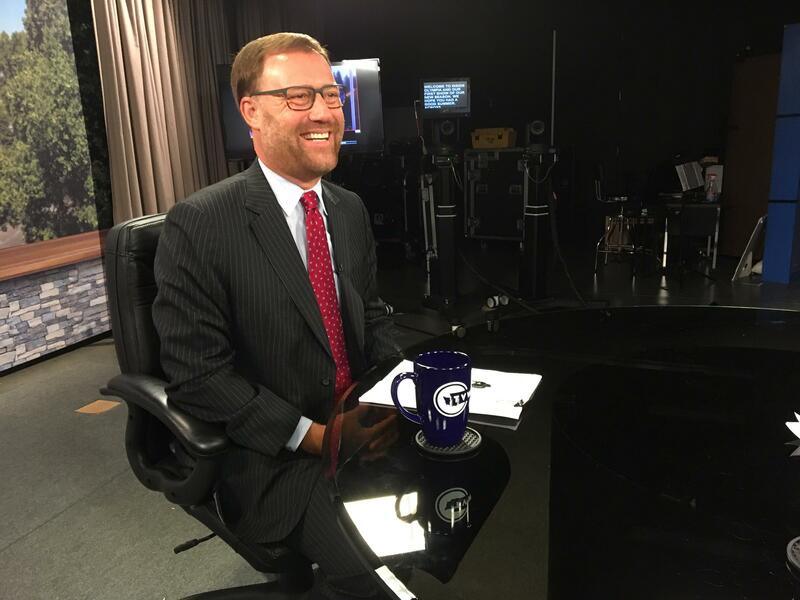 "It's wage theft," said Stephen Miller, vice president of the Washington Education Association (WEA), Thursday in an interview on TVW's "Inside Olympia" program. "They are taking wages away from public employees." The Washington Legislature recently freed up $2 billion in its current budget for teacher and staff salaries. That appropriation came after courts found that the Legislature had been unconstitutionally underfunding its public school system for years. The $2 billion allotment for teacher and staff salaries came as part of the final step in that decade-long lawsuit known as the McCleary case, and Miller argued that all of that money should go to fund salary increases in the current contract cycle. "This money, this year, is for the backpay of over 2o years of underpayment in Washington state," Miller said. In 2014, the Supreme Court wrote that it was an "inescapable fact" that teacher salaries were no better than when the McCleary case went to trial in 2009. The Court ordered the Legislature to fully fund educator salaries at a level "that will attract and retain the educators necessary to actually deliver a quality education." The executive director of the Washington Association of School Administrators, Joel Aune, took immediate exception to Miller's portrayal of the situation as a form of wage theft. "That kind of language is very disturbing and I frankly don't think it's productive or helpful to the process," Aune, whose association represents school superintendents and central office staff, said in a separate interview on TVW. Aune said districts have an obligation to balance pay raises in the current cycle with the long-term sustainability of their budgets. Next year, new limits on local school funding levies kick in, Aune said. This, he added, will result in half of the state's school districts losing significant amounts of money. "There are real challenges for school districts in 2019 and beyond and I think that's where the rub is," Aune said. Washington school districts are charting a dramatically altered landscape this year as they bargain new contracts, or contract extensions, with their teachers and staff. In addition to the infusion of new state funding, the Legislature eliminated a long-relied upon statewide salary schedule which previously served as a "baseline" for contract negotiations. Districts are also adjusting to the implications of a new "regionalization" system designed by the state legislature to give schools in high cost-of-living areas a bump in funding. However, some districts have complained the system unfairly penalizes them while advantaging neighboring districts. In the Puyallup district, for example, where teachers are currently on strike, Superintendent Tim Yeomans, wrote that his district received a six percent regionalization funding enhancement compared to some districts that received 18 percent. "Yes, a district receiving an 18 percent enhancement can provide a double-digit pay increase," Yeomans wrote. "A district with a 6 percent enhancement cannot." But Miller, WEA vice president, countered that the Puyallup district was getting "many millions of dollars" in new state money this year and said the superintendent should "stop playing games." In July, Superintendent of Public Instruction, Chris Reykdal, sent lawmakers a letter warning that their McCleary solution had created "massive differences in opportunities across the state for compensation changes." "Not every district will have an equal opportunity to provide compensation increases with double-digit percentages," Reykdal wrote in a follow up letter. To make things more complicated, there's been a lack of clarity about whether current state law allows such large increases for teachers and staff. A 2017 McCleary law limited pay hikes to 3.1 percent, however that provision was changed in updated legislation passed this year. Reykdal has since told districts that the 3.1 percent cap is "ambiguous." "You are limited by what you can afford and what you can sustain," Reykdal advised superintendents in his August letter. Some state lawmakers are already voicing concern about the sustainability of the large double-digit increases in many districts. "I think they've totally erred in what they've done," said Sen. Mark Mullett, D-Issaquah, a member of the Senate K-12 committee. Mullett said he's worried the pay raises will come at the expense of other McCleary priorities, including K-3 class size reduction, the hiring of more paraeducators, and the addition of a seventh period to the high school day. "Now all the money's gone," Mullett said. Miller, of the WEA, said he was "not aware" of any district that had committed class size reduction funds to cover teacher pay hikes. As of Friday, approximately 8,000 teachers were on strike in eight Western Washington districts, mostly along the I-5 corridor. According to the WEA, the number of strikes this year is unprecedented. The previous record was in three strikes in 2015. In an August letter to Gov. Jay Inslee and other state officials, Sen. John Braun, the ranking Republican on the Senate budget committee, called on state leadership to intervene in any school strikes. That intervention could include seeking court injunctions to force teachers back to work, Braun wrote. "It is ironic that with the state Supreme Court determining that schools are amply funded that the greatest threat to our students' education is from adults bickering over how to divide the bounty," Braun wrote. In a statement, Inslee's office said it's monitoring the strikes and getting updates from superintendents, unions and the Office of Public Instrucition. "We recognized this is a very challenging situation and that difference districts will implement funding in different ways, under local control," the statement said. Besides the eight active strikes, six other walkouts had been settled as of Friday morning, including in the Stanwood-Camano district north of Seattle and the Washougal district along the Columbia River where teachers unanimously ratified a contract that will give them an 18 percent raise in the first year. WEA estimated that teachers so far have struck contracts in at least 200 school districts across the state. Those districts include Shoreline, north of Seattle, where the new contract will give teachers an average 24 percent pay raise and bring the top teacher salary to $120,234, the highest in the state.